The Walk tells the true story of Philippe Petit (here played by Joseph Gordon-Levitt), the artist who walked a tightrope between the two towers of the World Trade Centre in 1974. As dramatic filmmaking it is rather episodic and uneven but as a piece of cinematic spectacle it doesn’t so much deliver in spades as deliver in 3D bulldozer sized shovelfuls. The central wire-walking set piece gives new meaning to the word wow. Petit’s extraordinary tale was recently the subject of Oscar winning documentary, Man on Wire. 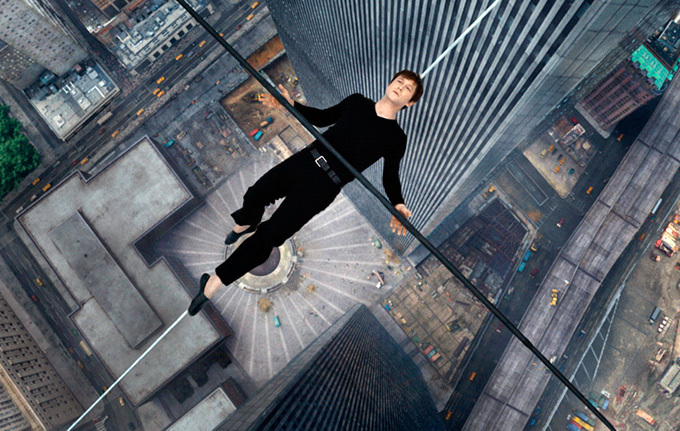 Frankly that is a much better film, but The Walk has an ace up its sleeve: director Robert Zemeckis. Much underrated compared with his contemporaries (Spielberg for instance), Zemeckis really knows where to place his camera for maximum vertigo-inducing 3D thrills. In this case, the special effects are very, very special indeed. When Petit steps out onto the wire, you will gasp, clutch at your armrest and quite possibly pass out, if you are afraid of heights. Outside of that phenomenal sequence, and the heist movie style fun that builds up to it, the film rather plods along bearably but not very interestingly. Frankly Joseph Gordon-Levitt’s French accent does not convince, nor is his relationship with his girlfriend Annie (Charlotte Le Bon) particularly engaging. The supporting cast do the best they can with the material, but even the presence of Ben Kingsley as Petit’s mentor Papa Rudy cannot lift the drama above the merely adequate. Man on Wire provoked a fascinating conversation with my wife. She thought Petit selfish and arrogant, whilst I could not help but admire his sheer courage and ambition, not to mention his tremendous skill as an artist. The Walk is unlikely to produce such a polarised response since frankly I found Petit as irritating in fiction as my wife found him in real life. In the end, The Walk is still well worth a watch because of Zemeckis’s sheer brilliance as a director of spectacle. So if you do go, make sure you see it on the biggest screen possible, and in 3D.